Check out the June issue of British Patchwork and Quilting for a chance to win! First prize £200 worth of fabrics * Second prize £100 worth of fabrics * Two third prizes £50 worth of fabrics * * fabrics in metre lengths from across the Fabric Freedom range and not necessarily as illustrated Last month we featured Sally Ablett’s Butterfly Carnival quilt as a project, so you’ll know that these fabrics are bursting with colour and vibrancy, encapsulating butterflies hovering amongst the flowers on a bright summer’s day. Trying again without the typos!.....Welcome to blogland, great to see you here. 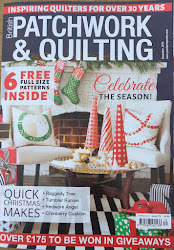 I've just become one of your new followers (and on Facebook too) and am off to read my new issue of P&Q and see what you write about Trudi (Quilting Prolifically!). Thanks Lis - and thanks for following! We are developing our digital footprint, lol! We're now on FB, Twitter, You Tube and we're blogging. I'm going to be sending out our blog buttons for all those talented bloggers out there who produce such wonderful material whom we choose to feature in the magazine, or who blog about articles they have liked or prizes they have won - I'll be running some special blog giveaways - please spread the word and watch this space! Look out in the magazine too for hints when you need to check out the FB page!